A recent quarterly report by Stericycle ExpertSOLUTIONS about Q2 2016 shows a rapid increase in product recalls in a variety of markets. Recalls can be associated with a growing number of reported consumer injuries in the first two quarters of 2016, already surpassing the total number of reported injuries in 2015. Recalls have impacted all consumer products, with the automotive industry being significantly affected. Recalls issued by NHTSA (the National Highway Traffic Safety Administration) grew about 40% over the first quarter. With the number of recalled units increasing to over 39.6 million, Q2 of 2016 was actually the quarter that was most significantly affected by recalls since 2000. Out of all 14.2 million recalls, 64.1% were issued because of automobiles, while other automotive equipment accounted for 35.9%. The top cause of recalls in the automotive industry is consistent with all but one quarters since Q4 2014, with airbags steadily producing the most defects since the end of 2014. In May 2016, federal transport regulators have issued the recall of 35-40 million more Takata airbags (added to the previously recalled almost 30 million) due to defective inflators. The primary source of issues with airbag inflators of this Japanese brand was rupturing in conditions of high humidity and fluctuating high temperatures, which has been tied to 10 deaths and over 100 injuries in the US. The risk of recalls can be reduced with mature risk management processes applied throughout the process of development. As software plays an increasing part in the functionality of all vehicles, advanced automotive development tools help manufacturers ensure the functional safety and reliability of their products. In the healthcare sector, the report records a high number of recalls in both the pharmaceutical and the medical device markets. Pharmaceutical recalls are up 35%, at their peak since Q3 2014, with the number of recalled units accompanying the growth (having increased by 169%). Among pharmaceutical companies affected by recalls, 14 companies experienced more than one recall in the first two quarters of 2016. 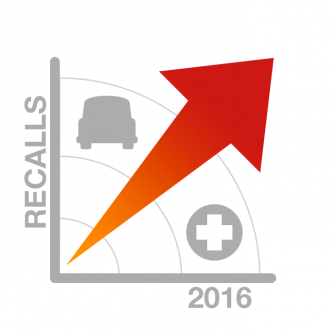 The number of medical recalls increased by 38% in Q2 over Q1, with the number of recalled units tripling. That said, the total number of recalled units in 2016 so far is still 30% lower than the quarterly average of the previous year. Almost all recalls this past quarter (99%) were Class II recalls. Remarkably, of the total of just under 280 medical device recalls, almost 40% can be attributed to quality issues, with software being listed in the top 3 causes. Of all medical device recalls, 49% were international. “One thing that we are keeping our eyes on in the medical device industry is the impact of the Internet of Things (IoT). As more medical devices and equipment become increasingly software based and network connected, these devices have also become vulnerable to hacking and security threats, creating potential health and privacy risks for patients” says Kevin Pollack, vice president at Stericycle ExpertSOLUTIONS in an article published on MDDIOnline. As a possible solution, he urges medical device developers to find adequate ways of tracking and reporting data. Want to learn about the processes & tools of Medtronic, a global leader in medical technology? Download our Medtronic case study! Having been awarded a TÜV “Trusted Tool” certification recently, and being successfully used by safety-critical companies worldwide, codeBeamer’s pedigree in the development of compliant safety-critical devices is excellent. The powerful features of codeBeamer ALM around process control and documentation, along with TÜV’s reassurance that our ALM platform is fit for use for developing ISO 26262 and IEC 61508-compliant products (up to ASIL D or SIL 3) make it a go-to solution for developers of automotive and medical products. To learn more about codeBeamer's TÜV certification, watch the webinar recording below. Have any questions? Contact us, or start your free trial today!